Since Creative Spark Engineering's founding in 2008, we have done a wide variety of work... from purely mechanical to highly multi-disciplinary. Following are some examples of that work. Of course, most of our work cannot be shown here due to concerns of confidentiality. If what you see here generates some questions regarding what we can do for you, please contact us. Our client, a medical device company, asked us to turn an early, functional prototype into a real device. Armed with an optical model from our optical engineering consultant, we first put together a conceptual solid model that provided the right imaging path (and looked VERY similar to the final product). We then talked about adjustability, usability and manufacturability requirements. After refining the design further and consulting with the contract manufacturer, we arrived at a final design. The result is an innovative, economical device that an optometrist or ophthalmologist can use to acquire and process images of the eye. The included iOS application uses a powerful, proprietary means to capture and process a perfectly-focused image, and the user-removable (but optionally secured) Apple iPhone 6/6S provides an amazingly high-quality and cost-effective user interface for operating the application and viewing the images. We have worked with a local medical device company on intellectual property and prototype development for ophthalmoscopes designed to image the retina by using methods that are inherently an order of magnitude less complex and expensive than the competition. Working collaboratively with optical and electronics engineering consultants, we designed three different systems that employed these patented techniques. One such system, which incorporated several additional features, used roughly 35 unique custom machined parts (along with many purchased parts) and seven servomotors to vary illumination and image path characteristics to a very high degree, in an effort to facilitate further characterization and method development. The simplest system was a hand-held device that used no motors and an iPhone as a user interface. These devices are all still "under wraps", so no photos or details are available. In order to successfully create these devices, it was necessary for us to become well-versed in the application of ophthalmoscopes in order to be able to contribute as usefully as possible to the design. Our client is very device-minded, so he provided many good device ideas (having done much of the "breadboard" work on his own), but our experience is that this is not always the case. Our clients don't always need to be inventors with mechanical minds in order to work well with us... 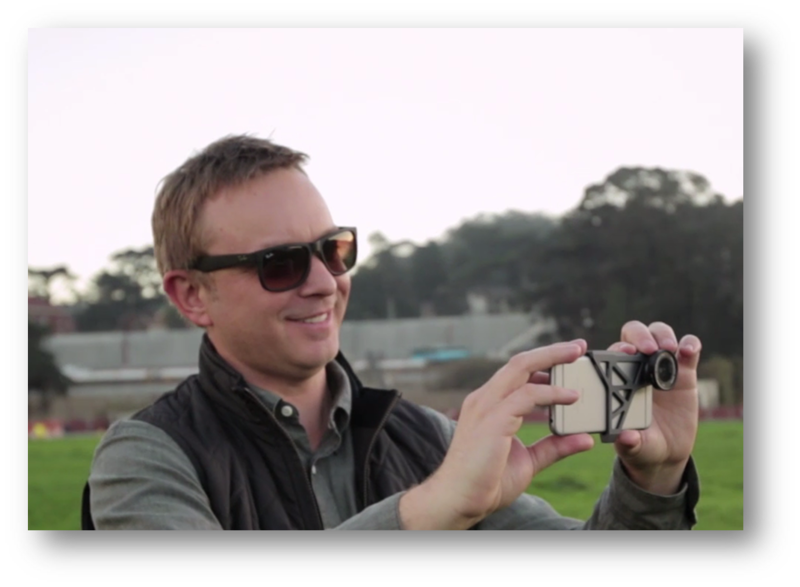 It is a specialty of ours to bridge that gap and simply turn functional needs into devices. This device has a simple operating principle, and there was a huge variety of ways in which the functional device could be physically configured. Shown below are a variety of concepts we created, based on ease of use, perception of quality, and functional requirements (physical orientation while sitting on a table, etc.) This is an FDA Class II device. Our client Stem Cell Partners LLC, a life sciences R&D company, asked us to design a medical device that provided a rapid and simple method to prepare cell concentrates from extracted adipose tissue in the operating room. A patented device resulted from the collaboration, wherein Rodney Sparks was named as co- inventor on patent. The patent was assigned to Stem Cell Partners, as agreed-upon. 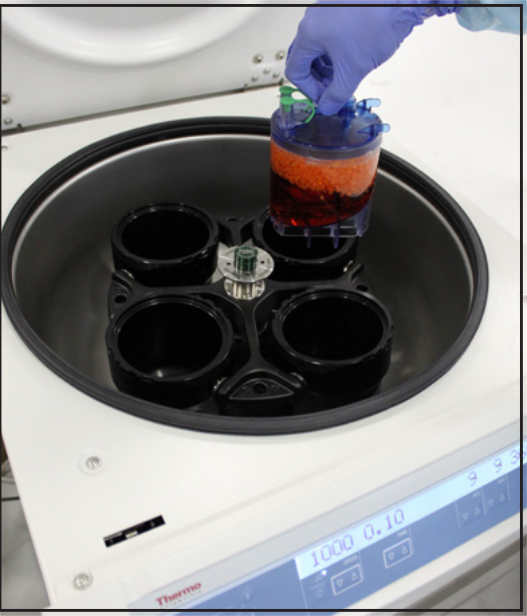 The medical device functioned both as a 400ml suction canister and as a centrifuge-based cell separator, producing 15ml of stromal vascular fraction (SVF) cell concentrate from that 400ml of lipoaspirate. In addition to contributing to the idea of the product, we designed and built usable 3D-printed prototype devices for the client in order to show proof of performance and marketing value. We then worked with a local plastic surgeon to do functional testing on the prototypes. The patent and design were subsequently acquired by a leading medical company and developed, with our engineering assistance, into a released medical product. 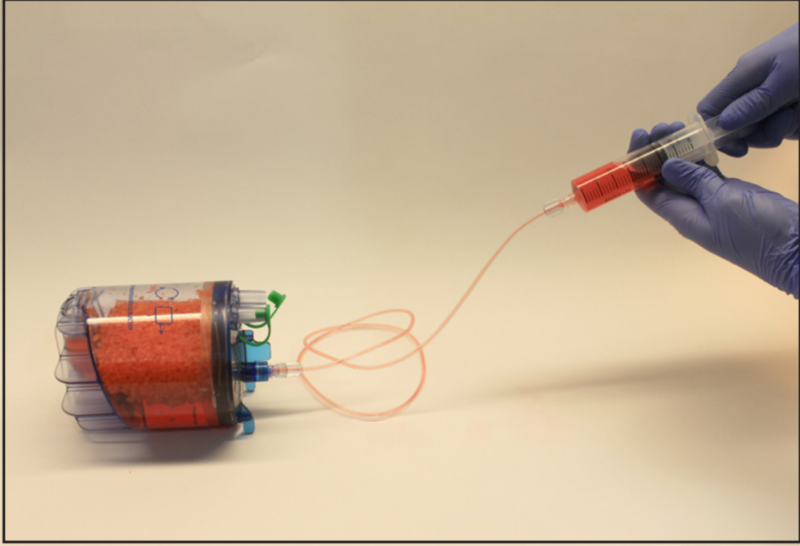 This is one of several blood/adipose centrifugation devices designed by Rodney Sparks of CSE since 2009, but the only one that has been commercially released and can therefore be publicly disclosed. In collaboration with Stem Cell Partners, we are capable of doing similar medical device research and development in the future. Not much can be said here due to confidentiality concerns, but it suffices to say that for regenerative medicine applications, it can be helpful to combine various biological fluids and tissues in order to form a consistent mixture that can be applied back to the patient's own body in order to accelerate healing. This 3-position, automated syringe pump enables the user to just that. This is a conceptual model that was never manufactured. I received a call from an Adam Wilson, with no prior product experience, who had one request: He wanted to make a better aluminum wallet. He had one of those clamshell-style wallets with a flexible expanding card holder inside of it, and wanted a better version of that. We met at a Starbucks and talked about concepts. 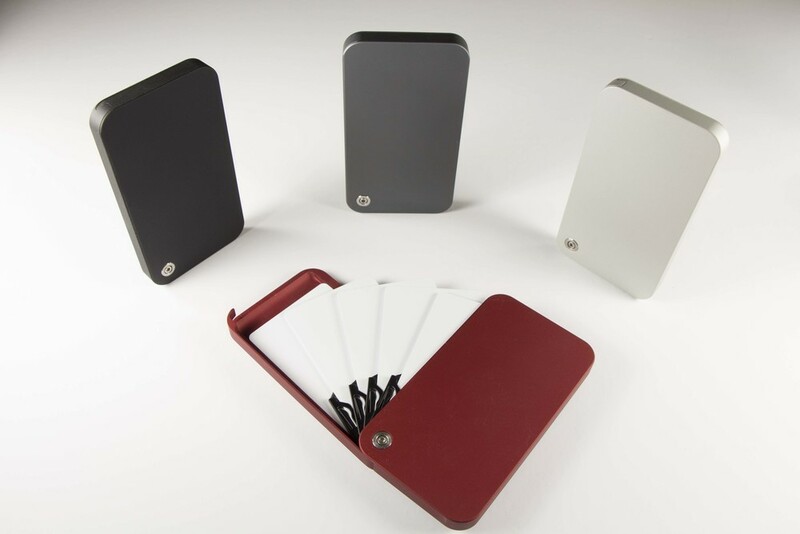 I suggested something different... a wallet that fans out like a stack of cards. I did a few conceptual models, and he liked it! He decided to do a Kickstarter campaign to raise money to produce a run of wallets. We built some prototypes, finalized the design, and launched the campaign, where he raised over $20k, selling 229 production-version wallets. We are now talking about a next version. Optrix asked us to provide engineering services for an improved iPhone 5/5S version of their iPhone 4-based ruggedized enclosure. Using design requirements/sketches given to us by their Creative Director and the outcome of subsequent brainstorming sessions to solidify those requirements, we thoroughly redesigned it. We incorporated a door at the bottom end of the enclosure, providing access to the power and headphone connectors, as well as the speaker and microphone. We re-engineered the seal geometry, improving manufacturability and seal performance under pressure. A modular rail system on the back of the case enabled the use of a variety of mounts. In testing, it achieved a depth of 33 feet with no leaks. We later designed an iPhone 6 version of the same case. Our client Optrix asked us to design a premium, machined aluminum bracket with a tripod mount for their existing line of photography lenses used on their ruggedized, waterproof iPhone enclosures. Optrix and I went back and forth with sketches and basic solid models to arrive at a concept with a look and feel that is refined, yet slightly edgy and geometric. We built several prototypes and evaluated the user experience, optimized the manufacturing method for cost and quality, and tweaked the dimensions for the best fit to the phone. The result was a product that felt good in the hand, helped the user take great photos, and was profitable to manufacture. It was eventually sold in the Apple Store. This is a modular, 1kW PEM hydrogen fuel cell system. CSE Principal Rodney Sparks led the mechanical design and did much of the systems engineering work on this system. 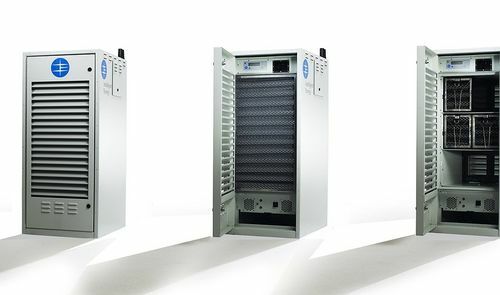 It plugs into a rack-mount backplane in order to replace Diesel generators as backup power for cellular tower sites in India, as their power grid is down 50% of the time in many locations. During the conceptual design phase, the design process reached a point where requirements and specifications were mostly defined, but no viable physical layouts existed. In a 3-day CAD marathon, Rodney put together a conceptual solid model that embodied the requirements defined thus far, and materialized them in a balanced, manufacturable, usable, modular manner. Rodney then led the mechanical design of the system, and although it was tweaked and refined, the general form and arrangement of components in the concept design was realized in the detail mechanical design. Portable fuel cell systems, especially with chemical-based hydrogen generation systems, are some of the most complex, temperamental, and challenging devices we've designed... and the most fun! Fuel cell stacks have extremely complex operational characteristics that must be tested exhaustively and characterized very thoroughly. Fuel cell systems invariably involve management of gases, liquids, heat, electrical output, air and hydrogen purity, electromagnetic interference, acoustic output, regulatory requirements, and user interaction. Fuel cell system technology is about as multi-disciplinary as anything we've seen. We have played leading and primary supporting roles in the design of portable fuel cell systems, for military development contracts and commercial applications, since 2004. Many "clean sheet of paper" concepts have been created in the initial stages of projects. Systems models have been built and used to configure and size hybrid fuel cell systems to achieve the desired output, such as fuel cell stack and battery sizing for an intermittent load (e.g. a transmitting military radio), as well as to plan subsystem/module partitioning and power conversion strategies. We have performed all levels of mechanical design such as "packaging" the system into a desired form factor, designing a new manifold or pump assembly, and integrating components and subsystems of a design in a manner that blurs the lines between engineering disciplines in order to minimize size, weight, and cost... and maximize all metrics of performance. We then built and tested these designs. Systems range from a 15W, 3" x 7" x 0.7" power module (includes hybrid battery and integrated hydrolysis management for chemical fuel cartridge) up to a larger, 100W hybrid system for military radio applications. Additionally, we've designed several electrical/fluidic interfaces between system modules and/or fuel cartridges. In addition to fuel cell power systems, we have designed five different chemical-based hydrogen generation systems based on three distinct chemistries, involving both catalyzed hydrolysis and thermolysis reactions. Where applicable, we designed, built and tested pumps, pressure vessels, relief valves, heat transfer devices, and many other proprietary features, devices, and subsystems. At this point, there are no designs that we can publicly disclose, so please contact us if you have any questions that this overview did not answer. We are not in a position to be able to disclose specifics about this project, but speaking about the project in general terms has value here. The project involved a large piece of ground support equipment (it is hauled behind a truck) that was in short supply, as all units currently being used were made decades ago, and as they wore out in the field, more were needed. We (and another consulting firm) worked for the prime contractor who had the contract to design, build, test, and eventually manufacture this piece of equipment. In order to arrive at a great final design, we thoroughly educated ourselves on all aspects of the device. We first reviewed several similar, available model and solicited user feedback with regard to use, serviceability, and specific features and annoyances. We then purchased, disassembled, and reverse-engineered the most widely-favored similar unit. We analyzed the kinematics of that unit's working mechanisms, created a beam-type finite element model in order to resolve the loads for each load case, and performed solid-element static stress analysis to visualize stress concentrations in order to become intimately familiar with all aspects of the design. After characterizing the reverse-engineered model, we started from scratch and designed our own, using USAF's specification as the primary driver of the design. CSE was responsible for the design of three very highly-stressed lifting mechanisms. We designed the kinematics to result in proper motion characteristics given existing actuators, then designed components for relatively low-quantity manufacturing (mostly welded steel and aluminum plate). The lifting arm components were constructed from welded 4130 steel plate and box tube (1/4"-3/8" wall), which had to be heat treated in order to be sufficiently strong. We used Autodesk Inventor's assembly FEA capabilities to properly analyze welds and bolted joints. When tested, the design functioned as expected.